We continue this series with a spunky Social Media Strategist — Founder of SM Cubed Consulting, Lauren MacEwen. Our interview covers informative topics including the catalyst that launched Lauren into the social media world, her biggest lesson, proper social media etiquette, ways she can show you how to effectively utilize social media in your business, and much more! We even got to meet her cat named Cow. 🙂 Enjoy! 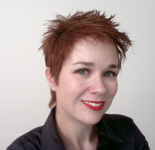 Lauren MacEwen is the primary strategist and creator of SM Cubed Consulting. After working for Disney Publishing for 3 1/2 years, Lauren decided to branch out on her own and started consulting in social media in an official capacity. Since that time she has been active in the Social Media community, forging relationships with national and international social media firms, communities and strategists. Lauren is a speaker on social media, blogging and social media as the new business model. She has a unique way of implementing social media strategy that combines the use of technology, and engagement strategy for relationship building. Her multifaceted approach delivers fast and powerful results. You can connect with Lauren on Twitter, Facebook, and LinkedIn. And be sure to sign up for her informative free email newsletter. This entry was written by Dr. Shannon Reece, posted on April 21, 2011 at 5:00 am, filed under Spotlight on Success Episodes and tagged Advisory of Women Entrepreneurs, businesswoman, entrepreneur, Lauren MacEwen, SM Cubed Consulting, Social Media, startups, strategies for women. Bookmark the permalink. Follow any comments here with the RSS feed for this post. Post a comment or leave a trackback: Trackback URL.